Woodcocks are easiest to find at dusk in the springtime, when the male performs a marvelous display flight, or “sky dance.” We will attempt to locate a woodcock or two this evening by visiting a nearby property where they are common. It can be difficult to locate the bird in dim light, so we will listen for the distinctive, buzzy peent call given by the male. We will make our best attempt to spot a displaying woodcock, as it is an experience not to be missed! Prior to looking for woodcocks, we will be joined by a very special guest, Michael Boardman, Maine based wildlife artist. He will lead a sketching workshop for all levels. This will include basic instruction, a quick demo and practice time sketching from a Woodcock bird mount. You are invited to bring your own journal if you have one. If not, we will provide everything you need. After learning how to draw these beautiful birds and munching down some pizza, we'll head out into the evening to look for woodcocks. Also bring the following: hat & gloves, warm coat, filled water bottle, binoculars, and a backpack in which you'll keep your stuff. A journal is optional for the sketching workshop. If you do not have binoculars, MYBC will provide you with a pair. 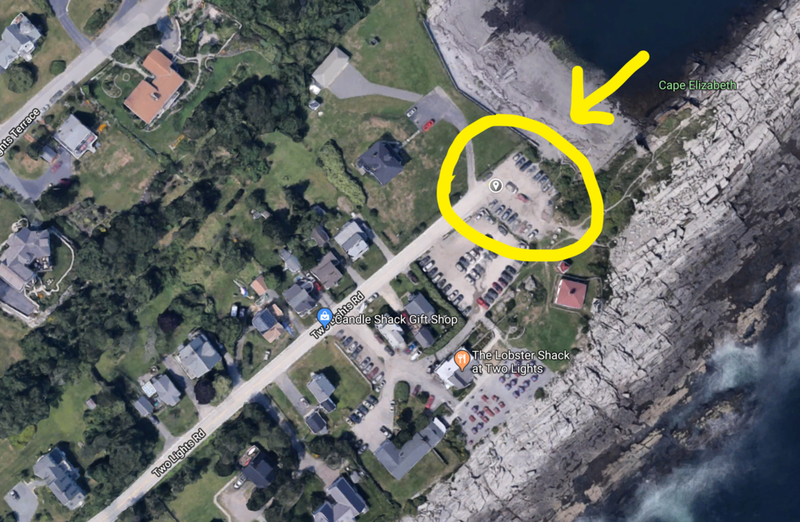 MEET UP and PICK UP: Meet us at 5:00 pm at the UNE (11 Hills Beach Road, Biddeford) parking lot next to the Student Academic Success Center along Hills Beach Road (see map below). We will be birding until 9:00 pm. Please arrive back at the UNE parking lot to pick up your child at 9:00 pm. Time to study our Owlgebra! February is a peak time to hear and possibly see Maine's owls while they are actively vocalizing in their efforts to establish a breeding territory and attract a mate. Join MYBC as we seek out these elusive raptors. We will be owling in the early morning at some reliable owling spots in Southern Maine (locations TBD). While visiting these areas, we have a good chance of hearing -- and possibly seeing -- Barred, Great Horned, and Northern Saw-whet Owls. There's even a very slight chance of encountering the uncommon Long-eared Owl and/or Eastern Screech Owl. PARENTS: We know this will be a very early start for you and your child, but the best time to go owling is a few hours before sunrise. That's when we'll have the greatest luck with these difficult-to-get birds. (As someone who has gone owling as a teen, take my word for it that it is an amazing experience and is very much worth a rare disruption of one's sleep schedule.) We are extremely grateful to you for your willingness to drive your daughter or son out for some super early morning birding! LOGISTICS: Dress in WARM layers and wear comfortable WARM walking shoes. Be sure to bring a hat, gloves, and toe/hand warmers if necessary. Please get sufficient sleep as we will be out very early in the morning. REQUIRED gear to bring: flashlight/headlamp (preferably one with red light capabilities), filled water bottle or two, snacks , warm hat, warm coat, cozy under-layers, gloves, socks, waterproof hiking boots, and binoculars. Optional items to bring: a bagged breakfast (if you think you'll get super hungry at 6 am), camera (optional), scope (if you have/want one), notebook & field guide (optional), and a backpack in which you'll keep all your stuff. If you do not have binoculars, MYBC will provide you with a pair. We will be done at 8:00 am. Pick-up will be at the Scarborough Marsh Nature Center parking lot (92 Pine Point Road, Scarborough). CARPOOLING: If you wish to carpool out of Biddeford with Seth or out of Westbrook with Marion, please indicate this in your RSVP or send us an email at info@maineyoungbirders.org. Robinson Woods trailhead parking lot. Winter birding in Maine can be fantastic along the coast, where seabirds are abundant along rocky capes and protected bays. We are going explore two productive seabirding spots: Biddeford Pool and Cape Elizabeth! Join us as we explore East Point Sanctuary, Dyer Point, Kettle Cove and other stops as time allows. In Biddeford we will search for visiting Snowy Owls and scan the water for Purple Sandpipers, and numerous sea ducks including Long-taileds, Buffleheads, and scoters. We will then move to Cape Elizabeth where we hope to see Harlequin Ducks, Eiders and scoters. There will also be a possibility of spotting the hard-to-find Razorbill, Dovekie, or King Eider. We may also venture to the Strawberry Fields in search of Snow Buntings and Horned Larks. LOGISTICS: Dress in WARM layers and wear comfortable WARM walking shoes. Be sure to bring a hat, gloves, and toe/hand warmers if necessary. We will be spending most of our time along the coast where it is exposed and cold, so it will be easy to catch a chill if underdressed. Bring the following: filled water bottle or two, snacks, a bagged lunch, warm hat, warm coat, cozy under-layers, gloves, socks, waterproof hiking boots, etc., binoculars, camera (optional), scope (if you have/want one), notebook & field guide (optional), and a backpack in which you'll keep all your stuff. If you do not have binoculars, MYBC will provide you with a pair. MEET UP and PICK UP: We will be meeting at 8:00 am at East Point Sanctuary at the parking spot off L.B. Orcutt Blvd. Follow GPS to East Point Sanctuary. Parking is along the right side of the street just before you get to Ocean Ave. PICK UP will be at Dyer Point at 12:30PM. 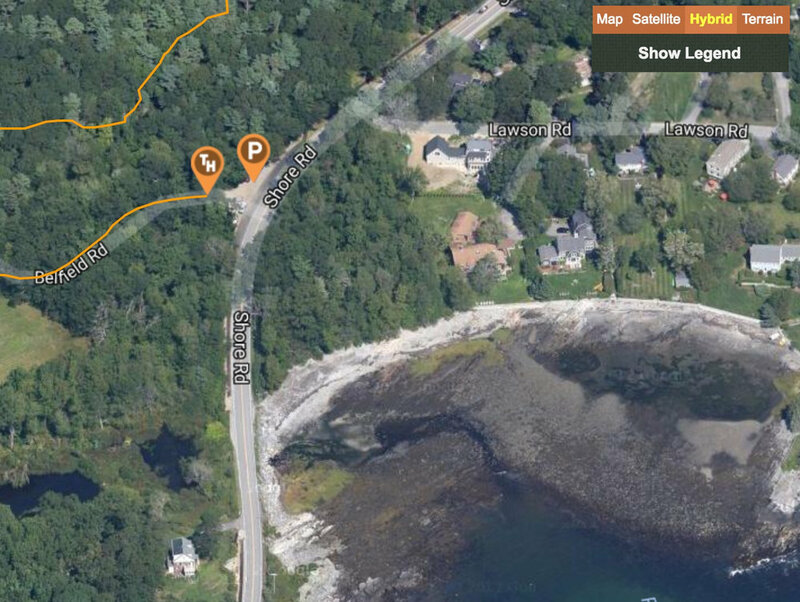 Follow GPS directions to the address of the Lobster Shack at Two Lights (225 Two Lights Rd., Cape Elizabeth). However DO NOT park at the Lobster Shack. Take Two Lights Rd. to its dead end where you will see a dirt parking lot. We will be meeting in this parking lot (see photo of map below). CARPOOLING: If you wish to carpool out of Biddeford with Seth Davis or out of Westbrook with Marion Sprague, please indicate this in your RSVP. Fort Foster, located in Kittery, is one of the premiere birding destinations in Maine. Located in Portsmouth Harbor, the 88 acre site includes 3 beaches with a trail system that connects the beaches together. A long pier extends off shore providing excellent platform for viewing water birds off shore as wells as views of Whaleback Lighthouse and Jerry's Point Lifesaving Station. We will explore the habitats of Fort Foster, searching for the beaches and trails for any lingering migrant birds and our returning winter visitors. We will, of course, keep our eyes peeled for any rarities that might be hanging around. MEET UP and PICK UP: We will be meeting at 8:00 am entrance to Fort Foster on Pocahontas Road in Kittery, ME. Pickup will be at 12:00 in the same spot. Did you know that World Shorebirds Day is celebrated in September? We decided it would be very appropriate to honor amazing shorebirds with a shorebird walk of our very own at two legendary shorebirding destinations: Hills Beach and Biddeford Pool. LOGISTICS: Dress in layers (it can be windy out on the ocean) and wear walking shoes (though we will be walking barefoot on the sandy beaches.) Bring the following: a bagged lunch, bug spray, sunblock, a hat, sunglasses, binoculars, camera (optional), and notebook (optional). If you do not have binoculars, MYBC will provide you with a pair. Meet us at 6:00 am at the UNE parking lot next to the Student Academic Success Center along Hills Beach Road. We will be birding until 11:45 am or 12:00 pm. Please arrive back at the UNE parking lot to pick up your child at around 12:00 pm. 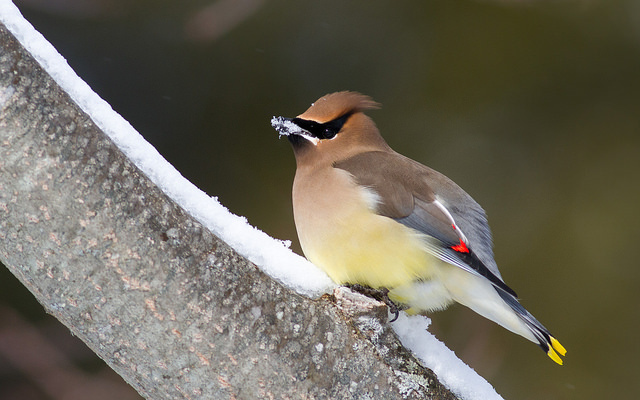 Come see one of Maine's most charismatic species on this Maine Audubon-organized trip! With its colorful, clown-like face and oversized bill, the Atlantic puffin has become one of the Maine coast’s most celebrated icons—a remarkable accomplishment for a species that had nearly disappeared from the state a century ago. Its resurgence is a testament to the dedication of Audubon biologists who led the way in reestablishing Maine’s seabird colonies, including Eastern Egg Rock at the mouth of Muscongus Bay. This popular evening boat ride sails out of New Harbor to Eastern Egg Rock, where we will circle the island several times for great views of puffins, terns, and other seabirds. The boat returns to the harbor at sunset to combine birding and a lovely summer evening on the Maine coast. LOGISTICS: We will meet at the Hardy Boat Cruises Dock. The boat will leave promptly at 7:00PM. We plan to be out until 9:00PM. WHAT TO BRING: Dress appropriately. We suggest dressing in layers. Remember the weather on the Maine coast is changeable. Bring binoculars, camera, hat, sunscreen and sunglasses. If you need binoculars, MYBC can provide them for you. PARKING: $4 per day per vehicle and payable in CASH ONLY. No credit cards or personal checks are accepted. Parking is located around the corner from the dock in a large grassy field. Please RSVP if you plan to attend and fill out this WAIVER. We do encourage parents to attend this event as well. There is no cost for the kids to attend, however parents will need to purchase a ticket on Maine Audubon's website. Typically, the Sanford Lagoons are only open from 7:00 am - 8:30 am on weekends, however the owners and operators of the facility were very gracious to MYBC and are allowing the club to have an extended visit on this Saturday! This will allow us to explore the entire area. We are extremely thankful for this opportunity. LOGISTICS: Dress in layers and wear comfortable, WATERPROOF shoes. though much of the Lagoon's pathways are well above water, we may move close to the edge so rubber boots or waterproof hiking boots are best. Also bring the following: hat & gloves, warm coat, filled water bottle, a snack and/or lunch, binoculars, and a backpack in which you'll keep your stuff. If you do not have binoculars, MYBC will provide you with a pair. MEET UP and PICK UP: Meet us at 7:00 am at the guest parking lot at Sanford Lagoons. To get there, from I-95 take Exit 32. At the light after the tollbooth make a right onto Route 111 West (Alfred Rd.). Follow for 11.4 miles and make a left onto Route 4 South. Follow it for 3.7 miles to the blinking light and make a left onto Gavel Rd. Follow past the entrance gate and park in designated spaces. You can also follow GPS directions to 192 Gavel Rd. Sanford ME, 04073. Pick up will be in the same parking lot at 11:00 am. PLEASE DO NOT BE LATE FOR PICK UP. The Sanford Lagoons will close promptly at 11:00 am and gates will close. CARPOOLING: If you wish to carpool out of Biddeford with Seth, please indicate this in your RSVP or send an email request at info@maineyoungbirders.org. Today will be truly special, as we will be learning how to band birds from University of New England (UNE) professor and ornithologist, Noah Perlut. Professor Perlut studies how wildlife are affected by human-managed habitats. Since 2002, he has been running a long-term research project on hayfield and pasture management and how this affects the life-histories of grassland songbirds such as Eastern Meadowlarks and Bobolinks. Professor Perlut also studies the ecology of urban roof-nesting Herring Gulls, marsh bird communities on the Saco River, and grey squirrel ecology on the UNE campus. To learn more about Professor Perlut's work, take a look at this article here. Professor Perlut will be taking us to one of his research sites in the woods near UNE campus. There he will set up banding nets to capture some local resident birds, which we will learn to remove from the fine mist nets, carefully observe and record data on the birds, discuss their ecology, and finally let the birds go. Professor Perlut will educate us about the importance of bird banding as an integral tool for understanding more about the birds around us, as well as its value for conservation. After bird banding, Lena will give a tour of UNE's Environmental Science lab, where she taught students how to prepare museum specimen skins of birds and therefore started the university's first ornithology collection. (To learn more about Lena's work, take a look at this article.) Lena will demonstrate the various bird skins in the collection and discuss the importance of such museum collections for the study of ornithology. Afterwards, she will take you to the new UNE student center building, which incorporated bird-safe glass into its design (you can read a Portland Press Herald article all about the bird-safe glass here). You will get to see this unique glass and learn all about how it prevents birds from striking windows, therefore saving hundreds of birds' lives every year. LOGISTICS: Dress in layers and wear comfortable, WATERPROOF shoes. We will be trekking through a wet marsh in the woods, so rubber boots or waterproof hiking boots are best. Also bring the following: hat & gloves, warm coat, filled water bottle, binoculars, and a backpack in which you'll keep your stuff. If you do not have binoculars, MYBC will provide you with a pair. MEET UP and PICK UP: Meet us at 7:15 am at the UNE (11 Hills Beach Road, Biddeford) parking lot next to the Student Academic Success Center along Hills Beach Road (see map below). We will be bird banding and touring UNE until 11:00 am. Please arrive back at the UNE parking lot to pick up your child at 11:00 am. Woodcocks are easiest to find at dusk in the springtime, when the male performs a marvelous display flight, or “sky dance.” We will attempt to locate a woodcock or two this evening by visiting a nearby property where they are common. It can be difficult to locate the bird in dim light, so we will listen for the distinctive, buzzy peent call given by the male. He intersperses this call, given from the ground, with his spiraling display flights. In the air, the male woodcock gives musical chirps and makes a twittering sound as air passes through his wingtips. We will make our best attempt to spot a displaying woodcock, as it is an experience not to be missed! Prior to looking for woodcocks, we will meet for a pizza dinner and games at the Student Academic Success Center (SASC) at the University of New England campus. If you are planning to attend this field trip, please RSVP to the email invitation you received and put in your topping preference for a personal-sized pizza from Pizza by Alex. (The pizza dinner will be covered by MYBC.) A variety of game options will be available, including birding trivia and board games, so come apply your birding skills in a fun, new way! After munching down some pizza and playing entertaining birding games, we'll head out into the evening to look for woodcocks. 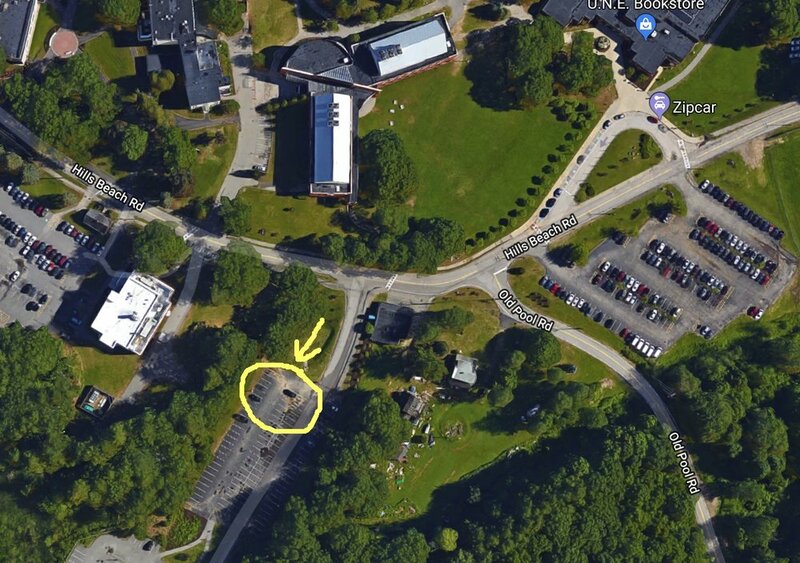 MEET UP and PICK UP: Meet us at 5:30 pm at the UNE (11 Hills Beach Road, Biddeford) parking lot next to the Student Academic Success Center along Hills Beach Road (see map below). We will be birding until 9:30 pm. Please arrive back at the UNE parking lot to pick up your child at 9:30 pm. Who Gives a Hoot About Whose Hoot is Whose? This will be a real hoot! February is a peak time to hear and possibly see Maine's owls while they are actively vocalizing in their efforts to establish a breeding territory and attract a mate. Join MYBC as we seek out these elusive raptors. We will be owling in the early morning at some reliable owling spots in Cape Elizabeth and Scarborough. While visiting these areas, we have a good chance of hearing -- and possibly seeing -- Barred, Great Horned, and Northern Saw-whet Owls. There's even a very slight chance of encountering the uncommon Long-eared Owl. Just before sunrise, we'll get on the Eastern Road in Scarborough Marsh, where we will have a slightly better than the usually very low chance of seeing a Short-eared Owl. PARENTS: We know this will be a very early start for you and your child, but the best time to go owling is a few hours before sunrise. That's when we'll have the greatest luck with these difficult-to-get birds. (As someone who has gone owling as a teen, take my word for it that it is an amazing experience and is very much worth a rare disruption of one's sleep schedule. ~Lena) We are extremely grateful to you for your willingness to drive your daughter or son out for some super early morning birding! We will be done at 7:00 am. Pick-up will be at the Scarborough Marsh Nature Center parking lot (92 Pine Point Road, Scarborough). CARPOOLING: If you wish to carpool out of Biddeford with Lena Moser, please indicate this in your RSVP or send her an email at info@maineyoungbirders.org. Winter birding in Maine can be fantastic along the coast, where seabirds are abundant along rocky capes and protected bays. We are going explore one such productive seabirding spot: Cape Elizabeth! Join us as we explore Two Lights State Park, Crescent Beach State Park, Kettle Cove, and Dyer Point, where we will look for Purple Sandpipers, and numerous sea ducks including Harlequins, Long-taileds, Buffleheads, and scoters. There will also be a possibility of spotting the hard-to-find Razorbill, Dovekie, or King Eider. We may also venture to the Strawberry Fields in search of Snow Buntings and Horned Larks, or to Spurwink Marsh in hopes of seeing the elusive Short-eared Owl. MEET UP and PICK UP: We will be meeting at 8:00 am at Dyer Point. Follow GPS directions to the address of the Lobster Shack at Two Lights (225 Two Lights Rd., Cape Elizabeth). However DO NOT park at the Lobster Shack. Take Two Lights Rd. to its dead end where you will see a dirt parking lot. We will be meeting in this parking lot (see photo of map below). We will be done at 1:00 pm. Pick-up will be in the same parking lot at Dyer Point. Young birders are invited to join the annual Christmas Bird Count (CBC) for Greater Portland on Saturday, December 16. The count will take place in the southern section of Scarborough Marsh and Pine Point. To learn about the history and significance of the CBC nationally and in Maine, click on the links provided. In the past, we've had such treats as Snowy Owl, Red-necked Grebe, Barrow's Goldeneye, and Bohemian Waxwing, as well as surprise species like Carolina Wren and American Pipit. Join us on this special day as we will endeavor to count each and every individual bird we see or hear in our count circle! We will hold the count as scheduled unless there is a major weather event. In the event of a storm, the count will take place on Sunday, December 17. If the weather for count day looks questionable, I will send out an email notification the day before with instructions. American Tree Sparrow. Photo by Fyn Kynd. LOGISTICS: Dress in WARM layers and wear comfortable WARM walking shoes. Be sure to bring a hat, gloves, and toe/hand warmers if necessary. We will be out in the cold for a long period of time, so it is easy to catch a chill if underdressed. Bring the following: filled water bottle or two, snacks, a bagged lunch, warm hat, warm coat, cozy under-layers, gloves, socks, waterproof hiking boots, etc., binoculars, camera (optional), scope (if you have/want one), notebook & field guide (optional), and a backpack in which you'll keep all your stuff. If you do not have binoculars, MYBC will provide you with a pair. MEET UP and PICK UP: We will be meeting at 6:45 am at the Scarborough Marsh Nature Center parking area (92 Pine Point Road, Scarborough). From U.S. Route One in Scarborough, turn east onto Pine Point Road (also marked as Route 9 West). The nature center is located .8 miles on the left. We will be done at around 1:00 or 2:00 pm, though you have the option of leaving the count sooner. If you wish to depart earlier, you will need to coordinate with your parent(s). A grand compilation of the bird count data will take place at 5:00 pm on the count day at the Gilsland Farm Audubon Center in Falmouth. This is a very fun event complete with snacks, hot chocolate, and the shared good spirits of a day devoted to birding. If you are interested in participating in the compilation, please express your interest in your RSVP. CARPOOLING: If you wish to carpool out of Biddeford with Lena Moser, send her an email at info@maineyoungbirders.org. Cedar Waxwing. Photo by Fyn Kynd. Pileated Woodpecker. Photo by Fyn Kynd. White-breasted Nuthatch. Photo by Fyn Kynd. Maine Audubon headquarters, here we come! “Situated along the Presumpscot River estuary just five minutes from Portland, Maine Audubon’s headquarters features a modern environmental education center and a 65-acre sanctuary with more than two miles of trails winding along a pond and through forest, meadow, orchard, and salt marsh. The variety of habitats and gentle trails at Gilsland Farm are ideal for nature study, wildlife-watching, walking, snowshoeing or cross-country skiing. Gilsland Farm’s meadows are nesting habitat for Bobolinks and Meadowlarks, a winter foraging spot for Canada Geese, and hunting grounds for Red-tailed Hawks and other birds of prey. As the state’s oldest and largest conservation organization, Maine Audubon has been promoting public environmental awareness and connecting people to nature since 1843. Maine Audubon has also been instrumental in supporting the mission and activities of the Maine Young Birders Club, for which we are very grateful. Join us in birding the Gilsland Farm property with Jeremy Cluchey, Director of Communications, and photographer Ariana van den Akker. Jeremy and Ari will be writing a story about the MYBC in Maine Audubon’s newsletter (Habitat), which is received by over 6,000 members! We are excited to spread the word about MYBC and our work with young birders. LOGISTICS: Dress in layers and wear comfortable walking shoes. Bring the following: filled water bottle, snacks, sunblock, a hat, sunglasses, binoculars, camera (optional), scope (if you have one), notebook & field guide (optional), and a backpack in which you'll keep all your stuff. If you do not have binoculars, MYBC will provide you with a pair. MEET UP and PICK UP: We will be meeting at 7:00 am in the Gilsland Farm parking area (right next to the building headquarters). We will be done at 11:00 am. From the north: Take I-295 to exit 10 and then left on Bucknam Road. At the light, turn right onto U.S. Route 1 and continue south for one mile. After the blinking light at the intersection of Routes 1 and 88, Gilsland Farm Road is on the right. From the south: Take I-295 to exit 9. Continue 1.9 miles north on U.S. Route 1 and turn left onto Gilsland Farm Road at our sign, immediately before the intersection of Routes 1 and 88. Meet us at 10:00 am at the UNE parking lot next to the Student Academic Success Center along Hills Beach Road. We will be birding until 3:45 or 4:00 pm. Please arrive back at the UNE parking lot to pick up your child at around 4:00 pm. If you are planning to attend, please RSVP and fill out this WAIVER. THIS TRIP HAS BEEN CANCELED DUE TO INCLEMENT WEATHER. This Maine Audubon-organized trip is sure to be a lot of fun! A 32-acre island 18 miles offshore at the mouth of Penobscot Bay, Matinicus Rock is one of Maine’s most important seabird nesting colonies. Here, Atlantic puffins, razorbills, common murres, black guillemots, arctic and common terns, and laughing gulls all gather to nest. Motoring out of New Harbor aboard the Hardy III, we’ll cross the mouth of Muscongus Bay, passing close by the seabird colony at Eastern Egg Rock where roseate terns nest. With plenty of open-water habitat along our route, we could see a good array of pelagic species, including Wilson’s storm-petrels, northern gannets, common murres, phalaropes, greater and sooty shearwaters, black-legged kittiwakes, and jaegers. Leader: Jan Pierson leads birding trips throughout the world as founder and president of Field Guides, Inc., a company specializing in international birding tours. Jan has been a Midcoast Maine resident since 1970. There is no cost for MYBC members... young birders can attend for free. Those of you who are coming from the south, Lena Moser will pick you up at the Biddeford Park & Ride at 5:45 am sharp. From there, Lena will drive you up to New Harbor, from where the boat departs. BRING: A bagged lunch and snacks, a book or other entertainment for when the boat is just motoring for a couple of hours and there's nothing to do, DRESS FOR WINTER (bring gloves, hat, warm coat... dress in layers and bring a roomy backpack into which you can stash extra clothes), and sea sickness medication (if you think you'll need it). We are off to Florida Lake which--under the right conditions--can yield a large amount of warblers and other migrating birds. MEETING LOCATIONS: We will start our day at the Florida Lake parking area off of Rte 125. For those of you coming from southern York Co., we will meet at the Biddeford Park and Ride (Alfred St, across from Walmart) at 7:00 am. WAIVER: If you are planning to attend, please RSVP and fill out this WAIVER. 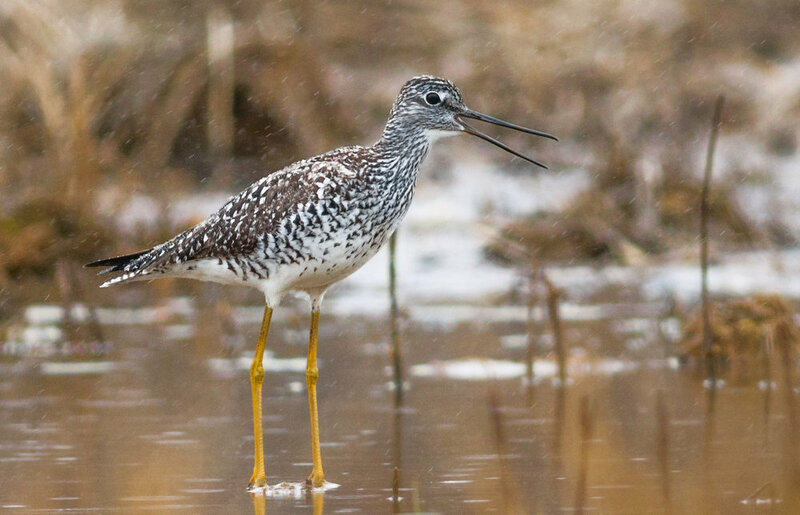 Late April birding in Maine is often considered less exciting than just a month later when full spring migration is under way, but Scarborough Marsh, ever the reliable hotspot, can easily yield over 50 species in a one day. So this month we will be traveling to Scarborough Marsh. Meeting Locations: We will start our day at the Eastern Trail parking area off of Rte 9. There will also be a meeting place to be determined for those of you coming from southern York Co.